Whenever one hears poker the ringing of ‘holdem’ follow suit. It is hard to escape the giants of holdem in the field of poker. But you will be surprised to learn that there are alternatives to holdem that are just as good and quite possibly better suited for you. Oasis Poker Pro Low is a version of poker that is targeted to various people but it is especially great for novices. The betting range is really low beginning from 10p and the gameplay has been ironed out of unnecessary complexities. It is a great game to function as a starter to poker. And for avid poker players who are just exhausted with the multiple aspects of holdem, will be relieved to know that they don’t have to quit poker altogether – there are other options! 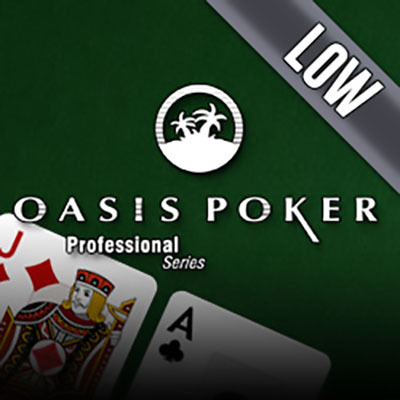 Oasis Poker Pro Low is a basic and reduced risk version of conventional poker. It simply has no space for bluffing and odd strategies like that. It is strictly played on the cards that are dealt and the forthcoming decisions made based on those cards. The game has 3 parts to it. 1) 2 cards will be dealt to players face-down. These cards are only for the players’ eyes and they are not exchangeable. Based on these cards, one has to make a decision – whether they would like to Check, Bet, or Fold. 2) Now 3 cards will be placed on the table, face-up. These cards are communal which means they are for everyone to use. After they are revealed, another round of betting will take place. 3) The 4th communal card will be dealt, where players can choose to place further bets if they like. 5) The 5th and final communal card will be placed on the table and players are invited to place their final bets. To place these bets, you need to be aware of the power of your cards. Below is a list of card combinations you need to get. They are listed from strongest hand to weakest. Royal Flush: 5 Card sequence with the same suit starting with a 10 and ending with an Ace: 10 – J – Q – K – A. Straight Flush: 5 Card sequence with the same suit. No specific numbers required as long as it is a sequence for example: 6 – 7 – 8 – 9 – 10. Four of a Kind: Having 4 of the same value cards like 4 Jacks, 4 Eights, 4 Kings, etc. J – J – J – 5 – 5. 4 – 7 – 9 – Q – A all of which are diamonds. 3 – 4 – 5 – 6 – 7. Three of a Kind: Having 3 cards of the same value like 3 Jacks, 3 Eights, 3 Kings, etc. Two Pairs: Having a pair of 2 same-valued cards. For example 2 Fives 2 Tens. One Pair: Having 1 set of same-valued cards. For example 2 Fives. If you do not have any of the options above, your highest card will play. Oasis Poker Pro Low is a great game to introduce poker to novices. The stakes are low which minimizes risks while the game is strictly focused on the cards at hand. A great game to familiarize – or perhaps test – oneself on the foundations of poker.